In this spare, lyrically written story, we join a child on a journey of self-discovery. Finding a way to grow from the inside out, just like a tree, the child develops as an individual comfortable in the natural world and in relationships with others. The child begins "Within/ The deep dark earth," like a seed, ready to grow and then dream and reach out to the world. Soon the child discovers birds and the sky and other children: Trees and trees/ Just like me! Each is different too. The child embraces them all because All trees have roots/ All trees belong. Maya Christina Gonzalez once again combines her talents as an artist and a storyteller to craft a gentle, empowering story about belonging, connecting with nature, and becoming your fullest self. Young readers will be inspired to dream and reach, reach and dream . . . and to be as free and unique as trees." When I first heard about this book last month, it was through a post on Facebook that linked to an article called "Why Create a Gender Neutral Picture Book?" Intrigued, I clicked. In the article, author Maya Christina Gonzales explained why she chose to write a picture book about a child whose gender is not revealed. The book uses no he or she pronouns. Gonzales explains that she knows many people who don't identify as one gender or the other. She wants all children to feel as if they belong, and therefore insisted that her picture book be written and marketed in a gender-neutral way. I rushed out and picked up a copy from the library. 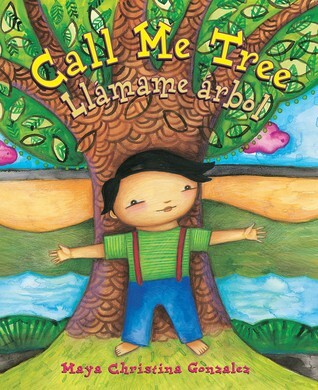 It's a beautiful picture book with bright illustrations and sparse language in both English and Spanish. However, if I had never read the article, I probably wouldn't have realized the gender-neutral tones. This isn't a book that hits you over the head with an agenda, but it DOES do a great job of conveying the message that everyone is unique and everyone should go after their dreams.